The Green Muse project has completed. Below is a video of part of the activity. Dottywood Community Arts is pleased to invite all to participate in a summer community art program, ‘Green Muse Project’. Activities will result in a large-scale environmental sculpture that celebrates biodiversity and be led by visiting artists Kathy Bruce and Alastair Noble. On August 14th, the artists-in-residence selected the lawn at Carnegie Hall in Lewisburg, WV from four possible locations for the temporary Green Muse sculpture. 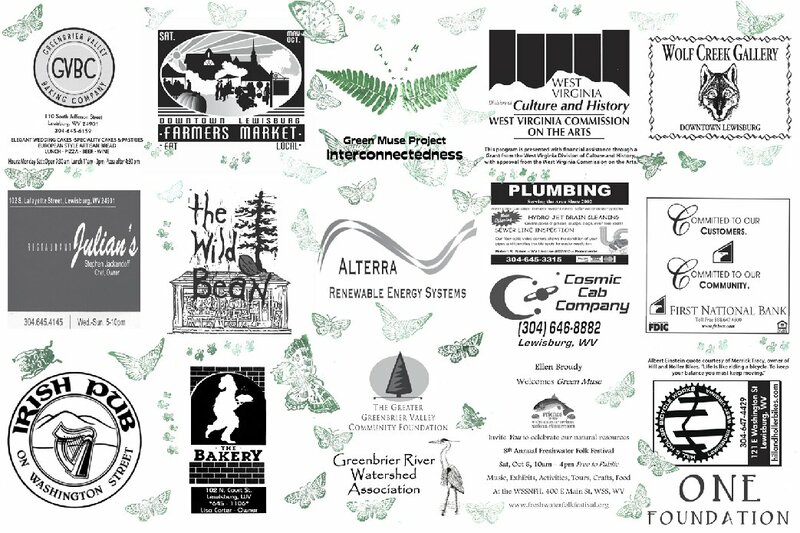 ~30 people attended the first Green Muse meeting at the Wild Bean where the location was announced, programs and schedules were folded for distribution from sponsor locations, and food was served with a pollinator theme (pizza with elements pollinated by bees, cupcakes with ingredients pollinated by butterflies, and chocolate pollinated by midge flies). The meeting had a party atmosphere, and buzzed with excitement. Wherever you are, you are in a watershed. It is the land area and water that drains into a common stream, lake and river. This includes water flowing on the surface and water underground. Starting near Durbin, Pocahontas County and flowing into the New River at Hinton, Summers County, the Greenbrier River receives water from 1,641 square miles of land.Beneath the surface, the world underneath our hills and valleys is a labyrinth of tunnels, huge rooms and glittering cave formations. Karst ( cave) lands make up 20% of the planet and hold unique life forms. Because karst is so porous, the natural filtering effect of water percolating through soil may not occur. Water can drop into a sinkhole and reappear virtually unchanged 30 miles away. So maintaining water quality our area presents challenges.Please visit www.greenbrier.org to contact us and find out more about the Greenbrier River Watershed Association, working to keep our watershed clean. A well-designed solar system can reduce or eliminate your power bill and lock in the rate you pay for electricity for decades. Solar is clean and reliable and almost maintenance free. We install commercial and residential solar systems that qualify for Federal and State incentives that can cut your cost by up to 60%. Visit our website and click the button for a Free Solar Assessment to learn about your options how much green power you could be producing. www.alterra-wv.com (304) 497-2756. Imagine your dream house. Incorporated into your house are many different elements forming a single unit. The walls are not just one layer, but multiple layers with different properties working together to keep out the weather, keep in the heat or cool, and support the structure. The roof is braced in multiple dimensions to withstand wind and weight and weather. The foundation is made up of different layers working together to support the walls, the floor, and provide a space for the plumbing, etc.. Imagine the most exquisite house that is architecturally interesting, energy efficient, and homey. This house would be composed of many parts all creating and contributing to the finished product, your dream house, your dwelling. The earth is like this house, it has many parts contributing to the whole. Thankfully, we did not have to make all of these parts, because there are millions of them and they are more complex than we can imagine. The part of the earth that is our home is called the biosphere and it is the sum total of all ecosystems, all of the parts. Global ecologists would describe the biosphere as self-regulating, that the life forms found in the biosphere work in concert to support a place for life to exist. Wow! You may be wondering, how do all of these different plants, animals, and other life forms work together to do that. Well, there are no managers overseeing a conscious effort, but even better, there are many individuals supporting the whole just by supporting themselves. That is what makes the biosphere able to perpetuate life, multiple life forms all living together in such a way that it enables life for all. We have a very beautiful home and it doesn’t just look pretty, it sustains us. Why? Because it is not built with one part, it is built from many different parts. That my friend is biodiversity, and without it, we would not exist. We exist thanks to nature and thanks to farmers who grow food for us, but not all farms are the same. Mega-farms rely on chemicals because those farms are trying to build something whole out of one piece and it is not pretty and it does not sustain us. Sustainable agriculture seeks to integrate the natural system with our human system, because that is the system that has given us life, not the other way around. Sustainable agriculture integrates, whilst non-sustainable agriculture eliminates. The strength of a given system is due to its’ ability to respond to changes and adapt. Farms are more resilient and sustainable when they are supported by an ecological system that is diverse. Monoculture farms are ecological deserts and subject to catastrophe if the environment is not consistent. Farms that are diverse and working with natural systems have resilience and the ability to recover from changing conditions. If we protect the diversity that exists in nature, we are protecting our future. Our Appalachian mountains contain some of the oldest bits of land on earth. First raised a billion years ago at the beginning of the formation of Pangea, these mountains have seen the rise and fall of the dinosaurs and provide an unbroken link to the unimaginably distant past. This history makes Appalachia a powerful and deep place of rich plant and animal diversity. How can I help nature thrive at home? “So if you cut down the goldenrod, the wild black cherry, the milkweed and other natives, you eliminate the larvae, and starve the birds. This simple revelation about the food web — and it is an intricate web, not a chain…”. From a New York Times Profile of Doug Tallamy by Ann Raver. Check us out & “Like” us on Facebook!